In an admirably far-sighted move, my band (the Wasatch and District Pipe Band) decided to forego the usual early-season trip to the Las Vegas Highland Games. Instead, we booked Jack Lee and Duncan Miller to come to Salt Lake and conduct a piping and drumming clinic. The rationale behind this decision was to build the two bands’ piping and drumming skills, so that we can go back to games like Las Vegas in the future and give an more excellent account of ourselves. Naturally, our expectations were high since Jack Lee is one of the best solo pipers of our generation, and is also the Pipe Sergeant of the Simon Fraser University Pipe Band – the current World Pipe Band Champions. We were not disappointed. In a remarkably intense weekend, Jack retooled both our Grade 3 and Grade 4 performance sets, and set us on the road to possible success in Scotland at the Worlds in 2010. Friday evening, Jack started out with a solo piping session, where he showed us how to set up our pipes for the best sound. We all use the same type of chanter reeds as Jack and the SFU Pipe Band, so he knows his way around them. After that, we switched to piobaireachd, and Jack coached us through The Desperate Battle (complete with crunluath-a-mach variations) and then The Munros’ Salute, a simpler, but very beautiful tune. On Saturday Jack evaluated our two performance sets and modified our Quick March Medley to make it flow better. The set now opens with a MAP tune, and next year will switch entirely to these tunes. (MAP stands for Musical Appreciation and Performance and are tunes approved for Grade 4 bands competing in Scotland under the rules of the Royal Scottish Pipe Band Association. They are all 2-part 2/4 marches.) By Sunday, we had learned the tune and played the new set on pipes, with the drum corps. In 24 hours we had completed a process that normally takes weeks in the Fall. Making these kinds of changes just a few weeks before the beginning of the competition season is quite risky, but our confidence is currently at a reckless high under Jack Lee’s tutelage! It was a fantastic weekend. Jack is a wonderful blend of kind, funny, intense and disciplined, and I know we’ve benefited immensely as a group and as individual pipers. Yesterday was the Salt Lake Highland Games, organized by the Utah Scottish Association – it’s the biggest highland games in Utah. It was also the first time out for the brand new Wasatch and District Grade 4 band, and we turned in a very creditable performance – 4th place! We are currently in the midst of the wettest spell I’ve encountered since moving here 3 1/2 years ago, so weather was always likely to be a contributing factor to the games this year. It turned out to be quite a feature! The morning started out dry(ish), but very overcast for solos. I felt really good in the piobaireachd. The humidity and cool air helped my pipes, and I played a tune I was happy with. I came in fourth, which was a little lower than I thought the performance merited, and I’m usually pretty modest about these things. I suppose the judge (and fellow Finn) John Partanen, must have spotted a few note errors of which I was unaware, and weighed them more heavily against me than the tenor of the conversation after my performance suggested at the time. As we chatted after I finished playing, he complimented my pipe and my performance. He did mention that my dropping 2 notes from the ground was a version not officially approved by the Piobaireachd Society. [This despite the fact that the past president of the Society plays that tune (Lament for Captain MacDougall) sans the extra notes!] It’s possible he decided to push his point home by dropping me down the placings for that reason. If so, I suppose I should be flattered that he decided to get that tough with me! I was wearing my Piobaireachd Society tie, so perhaps he held me to the stricter (some might say irrational) standard that I’ve supposedly embraced by joining! In any case, I had as much fun playing that tune as I’ve ever had, so I wasn’t at all unhappy with my numeric placing! I added marching this year to my 2/4 March (optional in Grade 4, but required if I move up a Grade next year). This is trickier than it ought to be. Despite marching in countless parades, the back and forth marching required in a competition 2/4 March feels very awkward to me. I will try to get more comfortable with it as the season progresses. My slow march had a few note errors that I don’t usually make – I play the tune all the time at funerals. Perhaps it’s time to replace it for competitions. I forgot to bring the music with me, which is customary for more obscure tunes. The judge said he thought he knew it. I told him I thought it might be on one of Gordon Walker’s CDs in the “World’s Greatest Pipers” series. The judge offered to give Gordon a call, and get him on the line while I played. After lunch, it was time to get ready for the inaugural public performance of the Wasatch and District Grade 4 band! We formed the band during the 2008 season, but were not quite ready to perform last year. This year we are now up to about 10 pipers, 3 snares, 2 tenors and a bass. We have a nice, straightforward Quick March Medley and it was time to compete. We were drawn first to play in the competition, which seemed a bit daunting at first, but turned out to be a big plus later! I thought we played really well. It was a little ragged as we marched into the competition circle, but we soon settled down and played a steady set right to the end. We had a clean strike-in and a clean cut-off, which always leaves a good impression. We stuck around after our set to listen to the next band play, but the gathering black clouds suggested we ought to take cover. We retired to our band tent just in time for a monstrous rainstorm to hit. We hung on to the tents to prevent them from blowing away (a couple did) and watched the other bands, who had drawn later playing times, tune up and march off into the downpour. When it was all over, we discovered we had taken fourth place – a very creditable performance, considering we were an unknown quantity even to ourselves. We missed third by just one point and discovered later that our lower piping score was due to one of our pipers starting out playing the wrong tune! He was very contrite, and promised not to do it again! The sun was back by the time of the closing ceremonies to cap off a wonderful day’s piping. 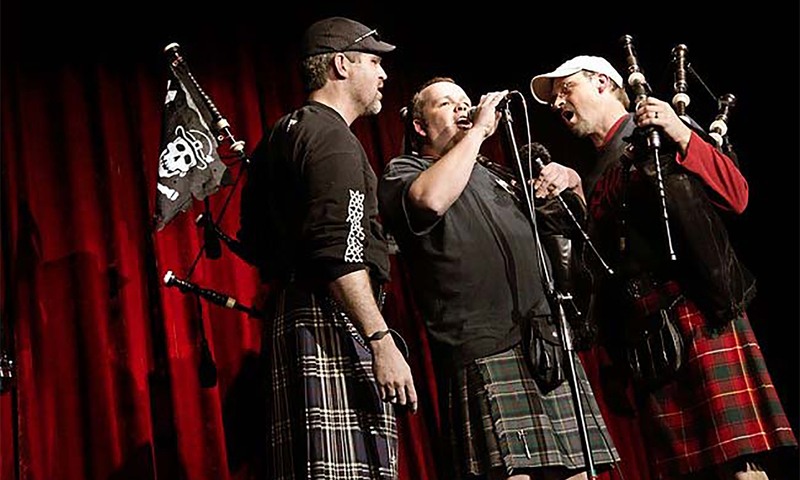 Next highland games – the Payson Scottish Festival in a month’s time. This week’s BBC Radio Scotland Pipeline show is definitely worth checking out, particularly if you are a piobaireachd fan. In the middle of the show is an archive segment from 1971, when the show’s forerunner was presented by Donald MacLeod, himself a piobaireachd legend. During the segment Donald introduces part of a beautiful performance by Jimmy MacIntosh of the tune Tulloch Ard, recorded at the Northern Meeting in Inverness that year. While attending the Meeting, Donald met and recorded an interview with Angus MacPherson, who was 95 at the time, and had been to every competition there since 1894. MacPherson’s grandfather had been a competing piper going back to the mid 1800s. MacLeod asks him about the influence of the “new” pipers coming to Scotland from Canada, the United States, New Zealand and Australia, and MacPherson talks clearly and enthusiastically about these “up-and-coming” performers from the early ’70s, many of whom are now retired! It’s amazing to hear a clear voice from so long ago talking about competitions that go back generations further. I wonder how many such interviews the BBC has in its archives? Well, I’ve only been a member for week and already I’m suffering from piping sensory overload. I will start with my review of Hugh MacCallum’s performance of the Lament for Donald Ban MacCrimmon. This is a very big tune, and one with which I am very familiar; I have listened to Hugh’s nephew, Willie McCallum’s winning performance of it from the 2005 Glenfiddich Championship almost weekly over the past few years. When I made that recording (from the BBC Radio Scotland Pipeline show), it was preceded by an interview with Willie, in which he describes his approach to the tune and the influence his uncle had on his own interpretation of it. Being so familiar with Willie’s performance, it was sheer joy to listen to what must have been a benchmark interpretation for him. Hugh’s performance has a lot of forward momentum (which you need, when a tune is 20 minutes long) but holds up briefly in all the right places. It’s actually quite deceptive – Hugh seems to hang on the upper note of each little “triplet” in Variation 1, singling and doubling, so that you think he’s going a lot slower than Willie, but the two men end up timing the whole tune to within 10 seconds of each other. That’s really amazing, for such a huge tune. The time flies by and the tune is over all too quickly. I would also like to mention the quality of the recording. John Dow, webmaster of the Piobaireachd Society, is confronting the labors of Heracles to clean up these tunes and make them available, but the quality is really excellent. Even some of the other recordings, which are clearly pretty old, are cleaning up nicely thanks to his diligence. Two other performances that I should also mention are duplicate recordings of the tune “The Marquis of Argyll’s Salute”. This is one of the shorter tunes in the repertoire. It’s a sparkling, loping tune, one that is a huge favorite of mine. Until now, I’ve had access to only an amateur recording (albeit a very good performance), but now there are two recordings of the tune on the Society’s list, one from Jimmy McIntosh and the other from John D. Burgess. I haven’t listened to these yet, but they’re next up! I join the Piobaireachd Society! In any case, this seemed like big enough news that I ought to make some sort of comment. Thanks to the generosity of my Mother (who actually got me into piping in the first place), I am now a member of the august organization that is the Piobaireachd Society. It has been fashionable (since the Society was formed, really) to denigrate it for all sorts of reasons (and sometimes for no reason). Well, I’m here to tell you that an organization such as this is equal to the sum of its parts, and I’m delighted to become a part of it as it enters its second century. Times are changing, and the Piobaireachd Society is well-poised to become the major positive influence on the continuing history of this beautiful music that it ought to be. Anyone who cares about the music should consider joining and add their efforts to the mix. In recent months the website has been dramatically overhauled and now features a fantastic members’ section, with a lot of archival materials including some stunning recordings. I’ll try to review of few of them in the weeks ahead as I get to grips with them all – I think there are about 40! The webmaster, John Gow, has been hard at work and some public thanks is probably due him for his efforts! Anyway, expect to hear more from me in coming days and weeks, and I will try to review some of the tunes that are available on the website (including those available to non-members), just to give you a taste! The David Barclay Memorial Competition – Year 2! Yesterday the Utah Pipe Band presented this excellent indoor piping and drumming competition for the second year. Just as it was last year, this competition is a welcome addition to the piping scene in Utah. It’s timed perfectly, since most bands have yet to begin the serious work of preparing for the next season, the previous season’s music is still relatively fresh in most players’ minds, and the Fall is often a quiet time in piping. This year the venue moved to the Hidden Hollow Presbyterian Church in Draper, a quiet neighborhood of this suburb of Salt Lake. Last year’s early-season snow storm was absent, and present were two new faces to Utah in the form of the piping judges – the husband and wife team (also Pipe Major and Pipe Sergeant team) of the Triumph Street Pipe Band, David and Shaunna Hilder. Two of the pipers in my band joined Triumph Street this past season, so they were able to arrange the inclusion of these prestigious names in piping. The event went off without a hitch (as far as I could tell) and I even played half-decently! I competed in the 2/4 march, the slow march and the piobaireachd. It was my final outing this year with my piobaireachd, “The Rout of the MacPhees”, and I played it as well as I ever have done. The piobaireachd competition was held in a large room with a high ceiling and a wooden floor. The acoustics were big, and it sounded as if I were playing in a baronial hall somewhere. I closed my eyes and pictured the stag’s heads and shields on the walls. David Hilder gave me some excellent comments and I even took second place – a wonderful end to the 2008 season. Thank you Utah Pipe Band, for organizing this wonderful event. Long may it continue! Usually, when I write about the Isle of Colonsay, it is in connection with the Clan Macfie. This, of course reflects my family’s links to the clan and the island. It should be noted, however, that the Macfies gradually left Colonsay during the 17th century, after which they became part of the ubiquitous worldwide Scottish diaspora. Over the next century or so, a new family became predominant on the island, the MacNeills, a situation that is still in place today. John MacPhee’s book, “The Crofter and the Laird” documents his year on Colonsay in the late 1960’s, during which time he interviewed a number of the MacNeills of Colonsay. For the most part, they had dispensed with the name MacNeill for everyday business (since they all had the same name), and substituted the places on the island where they lived as working surnames. Thus, Andrew MacNeill, who farmed the land on the island of Oransay (to the south of Colonsay, and ephemerally connected at low tide by spit of sand) was known as Andrew Oransay. This Andrew Oransay turns out to be a major piping authority, and not only that, but a link to one of the two schools of piobaireachd. Piobaireachd players like to trace their piping lineage, through their various teachers, back to the MacCrimmons of Skye in the 17th and 18th centuries. The path back to the MacCrimmons splits (somewhat contentiously) in the 19th century, with two schools of thought claiming “correct” interpretation of the big music. One style ultimately came to predominate, although the second has always had its adherents, and Andrew MacNeill of Colonsay (as he is known in the piping world) turns out to be one of the latter. He won a few competitions before the Second World War, and appeared to be a rising star but, on returning from the War, never made the promised impact on the competition circuit. Still, he was much in demand as a teacher and a mentor, and it becomes clear that many influential pipers who did go on to competition victory could thank Andrew for his assistance in doing so. One who benefited from his help was William Barrie, a Canadian piper, who later wrote one of the most famous “new” tunes of the past few years, “Andrew MacNeill of Colonsay“. This tune has been recorded by the current World Pipe Band Champions, the Simon Fraser University Pipe Band. He was also ready to help out anyone who asked for his piping help, including several members of the Bob Dunsire Piping Forums, an online forum for piping discussion (of which I am a member). Recently, one of the regular members asked fellow posters to supply any memories they may have of Andrew. A very interesting discussion has developed, during which at least one person has revealed he possesses a large amount of correspondence and taped material from Andrew. The discussion is still ongoing (and I have yet to find out in which year he died), but little did I know when I walked/paddled across to Oransay with my family on a soaking wet summer’s day in 1985 to visit Oransay Priory, that I may have been yards away from one of the major figures in 20th century piping. Last night I played for a outdoor wedding at a beautiful and secluded ranch in the mountains outside Salt Lake City. I was asked to play for about a half hour prior to the service, while the guests were arriving. About half-way through this, the wedding organizer came up to me and asked if I could hear the bull in the next field. Sure enough, after each set of tunes there was a distinctive bellow coming from the field behind the trees. I asked if she thought the bull was happy, or unhappy with the piping. She said she couldn’t tell. There is a piobaireachd tune called “The Red Speckled Bull”. I decided to play the ground of the tune just for the bull and see if he liked it. When I finished, I listened. Total silence. I wasn’t sure if this signaled approval or not, and I was getting ready to play another tune – this one about a cow – when the wedding party arrived and I had to switch to more traditional tunes. So I still don’t know if the bull was happy with my choice of tune, but I’ll bet not many pipers get to play that tune in the presence its namesake. If you like the tune “Too Long in this Condition” (and what’s not to like?) you should check out this week’s edition of Pipeline. The tune is played by Pipe Major Roddy Weir (formerly of the Army School of Piping) but, unlike most performances I have heard recently, Roddy chooses to play the Binneas is Boreraig version. This version of the tune includes a variation not usually played. It falls between the ground and what is usually played as the first variation and takes the form of a kind of triplet variation. It’s interesting because it appears to interrupt what is usually the increasing level of complexity in a tune as the variations progress. Justin, if you’re reading this, have a listen to the tune and tell me what you think. I’m back…and I choose a tune from my previous two posts! For reasons too numerous to mention I have not posted for nearly two months. I didn’t really notice the time passing (which is either good or bad), so now I ought to rectify the situation. It seemed reasonable (after such a long break) to start back by referencing my previous two posts, and I can do so without artifice because I really have had to make a choice which involves them both. The 2008 competition season has arrived for this lowly piper and with it a choice of tunes in piobaireachd for the upcoming competitions. All winter I have been putting off the decision: should it be my eponymous web tune, “I Am Proud to Play a Pipe” or my family-connected tune “The Rout of The MacPhees”? Both tunes are on the Piobaireachd Society’s Silver Medal list for this year, both have reasonably straightforward grounds and 1st variations (that is all I have to play in my grade), and both have compelling reasons for me to choose them. Well, the wait is over – I finally made my choice. I picked The Rout of the MacPhees. It comes up in the competition list a lot less frequently than I Am Proud to Play a Pipe and is perhaps a little less technical. And there is that wonderful family connection. Still, I’m going to have to work on my edres and D-throws, since the ground is stuffed full of them. I will also have to get inside the tune, since on the face of it, it is quite repetitive. That makes interpretation very important, or the tune will just end up being boring. My instructor (and soon-to-be belt winner) Justin Howland will help me with that, I have no doubt. Well, I’m back. I’ll try not to be silent for quite as long this time.